Design a One Instruction Set Computer! Notice: I'm willing to give a bounty to any answer that I find interesting. An OISC is an abstract machine that uses only one instruction – obviating the need for a machine language opcode. With a judicious choice for the single instruction and given infinite resources, an OISC is capable of being a universal computer in the same manner as traditional computers that have multiple instructions. Here are some examples of single commands that make a Turing-complete OISC. You must provide an interpreter for your language. This interpreter should only be restricted by memory/time (e.g. must have no user-imposed restrictions). If you do not provide an interpreter for your language (for whatever reason other than laziness) you must prove that it is possible for one to be written. An interpreter must be possible. You must include a formal proof that your language is Turing-complete. A simple way to do this is by proving that it can interpret or have the same behavior as another Turing-complete language. The most basic language to interpret would be Brainf**k.
For example, a normal language that has all the same commands as Brainf**k (and the same lack of user-imposed memory restrictions) is Turing-complete because anything that can be implemented in Brainf**k can be implemented in the language. Here is a list of very simple-to-implement Turing-complete languages. This OISC should only have one instruction - it cannot have multiple instructions with one of them making it Turing-complete. Your OISC may use any syntax you like. You should define in your answer what is instruction, what is data, and what is a no-op (e.g. whitespace). Be creative! Arguments do not just need to be integers. For example, /// is a beautiful example of a Turing-complete OISC. How and if input and output are taken and given are left up to you. Most OISCs implement I/O via specific memory locations, but there may be other ways to do so, and you are encouraged to find one. A valid answer must provide some example code in your OISC, either by including it in the post or linking to a simple challenge solved in the language. As with popularity-contest, the answer with the most votes wins! Good luck! Draw is an OISC acting on a 2D grid, marking squares in a manner similar to the Wang B-machine. However, to keep the language as simple and OISC-y as possible, all instructions (of which there are a grand total of one) mark the square just stepped on, and, in order to be able to halt, stepping on a marked square terminates the program. The program consists of a sequence of lines containing a line identifier (arbitrary string not including # or whitespace), two integers (x and y) and two more line identifiers (a and b). Starting at the line identified as start with the pointer pointing to position (0, 0), move the pointer by the amount given by x and y and mark the square the pointer is now on (unless the square is already marked, in which case execution terminates). Then, jump to line a if at least one of the directly adjacent squares is also marked, and to line b otherwise. Interpreters are encouraged to output the final result of the grid as some sort of image, canvas, etc. Draw is Turing-complete as it is possible to compile a modified version (called Alternate) of a Minsky machine into the language. Alternate acts similarly to a two-counter Minsky machine, but there is a large restriction placed on the commands: commands must alternate between targeting the first and second counter. To get around this modification, an additional command has been added: nop. This command doesn't change the targeted counter at all, which makes it possible to "pad" consecutive changes to one counter, satisfying the restriction outlined above. This also means that the register that is to be modified doesn't have to be given and, for any given instruction, can be directly inferred from the instructions from which execution can jump to it. This restriction is necessary due to the way that the eventual Draw program handles registers, which is to say that it doesn't differentiate them at all. Instead, the Draw program simply copies the register that hadn't been changed by the preceding instruction, modifying it according to the instruction being executed. The program starts with this block. Change the numbers in the i1_x parts to the index of the current instruction, and in the i2_x parts to the index of the next instruction to be executed. i3_x refers to the instruction to be called if the counter is already 1. Change labels appropriately and simply chain everything together. Doing this for the example from above gives the Draw program in the repository from above. There are currently two interpreters, both written in Python. They can be found on Draw's GitHub repository. draw.py: This interpreter is meant for the command line and takes the program source as an argument. After every step, it outputs the command that was executed and the location of the instruction pointer; after the program halts, it prints the number of marked cells. draw_golly.py: This version uses Golly for exactly the wrong purpose easier graphical output, taking the source via a popup box when starting the script. Golly can be a little finicky with Python, so make sure you have Python 2 installed (and don't mix 32-bit Golly with 64-bit Python or vice versa). 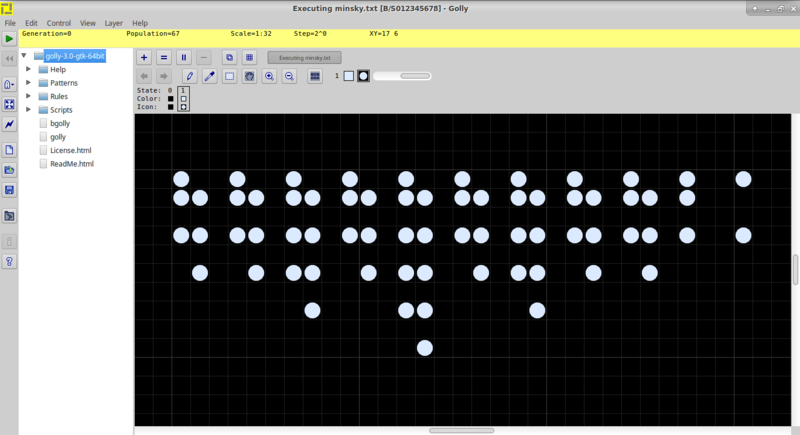 Output is provided via Golly's builtin cell grid. Example for output from the second interpreter: running the example program in the repository gives this (or similar). The final computation will be \$(\dots ((\dots (s_1\ s_2) \dots)\ s_M)\ a_1) \dots) a_N \$. Finally evaluate the stack: \$((X\ (X\ X))\ (X\ X))\ (X\ X)\$ or with less parentheses \$X\ (X\ X)\ (X\ X)\ (X\ X)\$ which we recognize as the good old \$S\ K\ K\$ identity function. For XOISC to be Turing complete we need to be able to translate any (valid) interleaving of parentheses and \$X\$ combinators. This is possible because when popping, applying and pushing it does so in a right-associative manner (function application is left-associative). To translate any such \$X\$ expression there is an easy way to do so: Always pop as many elements such that from the beginning of the current level of parentheses there will only be one element left. 0 0 2 0 2 0 2 Try it online! If we stay with this strategy we can easily transform any expression consisting of \$X\$ combinators to an XOISC program which only leaves a single function on the stack. The first part - proving the three equalities in the introduction - is very tedious and space consuming, it's also not very interesting. So instead of putting it in this post, you can find here*. Since the untyped lambda calculus requires us to define our own data types for everything we want and this is cumbersome the interpreter is aware of Church numerals - this means when you supply inputs it will automatically transform numbers to their corresponding Church numeral. As an example here's a program that multiplies two numbers: Try it online! You can also supply functions as arguments by using De Bruijn indices, for example the S combinator \\\(3 1 (2 1)) (or λλλ(3 1 (2 1))). However it also recognizes the S, K, I and of course X combinator. By default the interpreter checks if the output encodes an integer, if it does it will output the corresponding number (in addition to the result). For convenience there's the -b flag which tells the interpreter to try matching a boolean instead (see the last example). * In case the link is down, there's a copy as HTML comment in this post. ** This results in a program that tests for primality, try it online! Memory is a map of tapes, where the keys are strings and values are arbitrary-sized integers. Additionally, there is a set of labels, where the program can jump to. There is a stack, which contains the operands, which are strings. There is an offest, which controls where in the memory's tapes it can access. Note that if there are excess arguments or insufficient arguments, the program will error out, showing the program's state. The offset can be modified by accessing the value of .. This sets variable i to 7, by incrementing 7 times. This multiplies i+1 by the constant 2. Disregarding C++'s int sizes (that is, assuming they are infinite), -3 is Turing Complete by reduction to 3-cell brainfuck. I can disregard this size because there can be written an interpreter for -3 on a computer with infinite memory that has arbitrarily-large cells. I also believe that any BCT can be written as a -3 program. Not the answer you're looking for? Browse other questions tagged popularity-contest language-design or ask your own question.